These ten women--Dorothy Parker, Rebecca West, Hannah Arendt, Mary McCarthy, Susan Sontag, Pauline Kael, Joan Didion, Nora Ephron, Renata Adler, and Janet Malcolm--are united by what Dean calls "sharpness," the ability to cut to the quick with precision of thought and wit. Sharp is a vibrant depiction of the intellectual beau monde of twentieth-century New York, where gossip-filled parties at night gave out to literary slugging-matches in the pages of the Partisan Review or the New York Review of Books. It is also a passionate portrayal of how these women asserted themselves through their writing in a climate where women were treated with extreme condescension by the male-dominated cultural establishment. 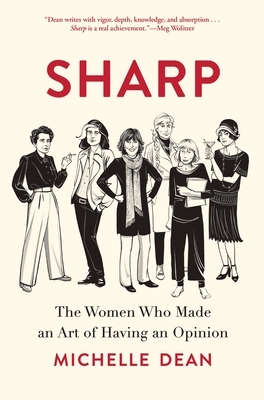 Mixing biography, literary criticism, and cultural history, Sharp is a celebration of this group of extraordinary women, an engaging introduction to their works, and a testament to how anyone who feels powerless can claim the mantle of writer, and, perhaps, change the world. Michelle Dean is a journalist, critic, and the recipient of the National Book Critics Circle's 2016 Nona Balakian Citation for Excellence in Reviewing. A contributing editor at the New Republic, she has written for the New Yorker, Nation, New York Times Magazine, Slate, New York Magazine, Elle, Harper's, and BuzzFeed. She lives in Los Angeles.